Welcome to BestCasino.net’s Craps tips section. This is where we try to guide you a little in your play so that you might have a better time or, at the very least, not find yourself completely out of luck. 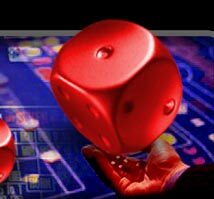 Here are some of the best tips for playing craps in online Casinos. The object of the game of craps is trying to figure out whether the shooter will roll a winning combination. 1. Make a betting selection(s) or establish a pattern of play to your liking and stick to it. 2. If you want to play longer and enjoy the action, stick to the 'pass/don't pass' and 'come/don't come' bets. 3. If you aim to 'hit and run' and winning is a priority, give preference to high-odds bets. 4. Don't plan to win every roll of the dice. 5. Raise as you win, lower as you lose. 6. Never quit after a win. 7. If the table is choppy a good way to hedge your bet is to establish a don’t pass bet then place bet the 6 & 8. 8. On the come out roll, place a pass bet and an equivalent field bet, that way if the shooter craps out, you still win in the field, if the shooter wins with 7 or 11 you still break even. 9. Try to do the same as the player with the most chips. If he's a hi roller then use a smaller amount for yourself. 10. Don’t press your place bets until you take your winnings down at least once first. 11. Never walk up to a table and throw your money in. Take a moment to review the table, people and the game in progress. I neglected this once and was yelled at by the dealers and players alike. 12. Give people elbowroom, if you aren't betting, get off the rail. Your standard bet for this strategy should be in increments of three units so as to take advantage of the free-odds allowances. This strategy makes maximum usage of the free-odds bets, wagers the house has no edge on, and brings the overall house advantage down to the barest minimum possible in a single odds game. 1. Make three unit pass line and come bets until we have two points established, and back both those bets with the maximum single odds allowed. 2. Every time a point repeats, whether as a come or pass line point, make another three unit pass line or come bet so you can continue to have two points working for you. If a 2, 3, 11 or 12 declares a winner or a loser on the new pass line or come bet, you follow with another bet until you get that second point established and then make the maximum single odds allowed on that point. 3. If the shooter sevens-out, clearing the board of all bets, you should begin the progression again with a new pass line bet.